On the daily chart, the instrument has broken the upper border of Bollinger Bands and has slowed the strengthening. The price range is widened, which reflects the possibility of the upward movement development. MACD histogram is around the zero line, its volumes are minimal, and the signal line is moving horizontally. 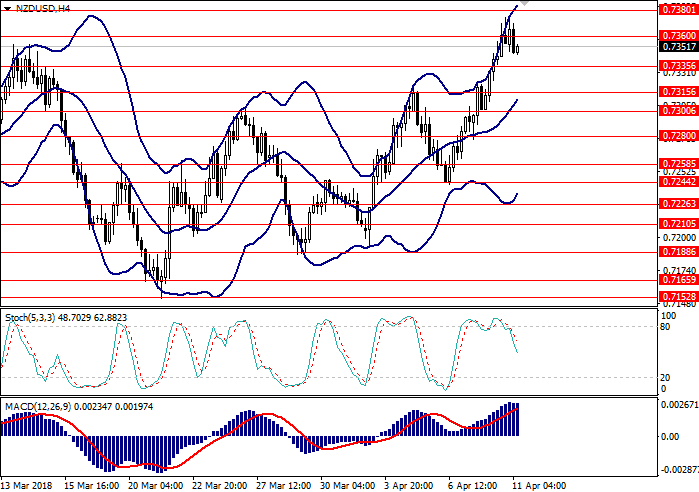 Stochastic is at the border of the overbought area, its lines are directed upwards. 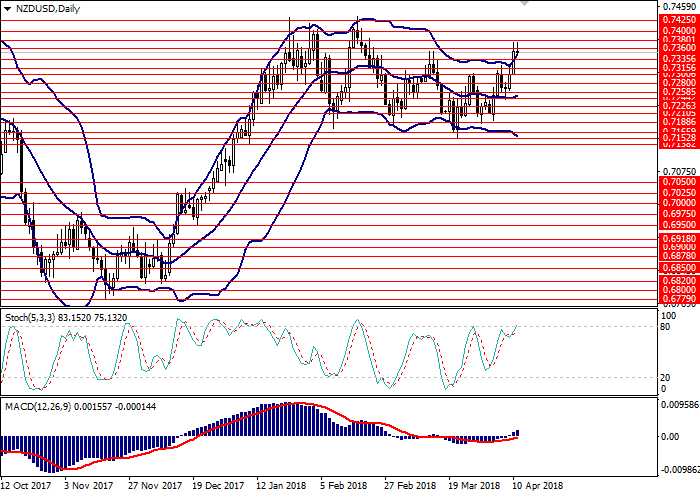 On the 4-hour chart, the upward movement is in the correction, the instrument is trading around the upper border of Bollinger Bands, and the price range is widened. MACD histogram is in the positive zone, the signal line crossed the histogram’s body upwards, giving a signal to open long positions. Stochastic has left the overbought area and formed a signal to open short positions; its lines are pointed downwards. Resistance levels: 0.7360, 0.7380, 0.7400, 0.7420. Support levels: 0.7335, 0.7315, 0.7300, 0.7280, 0.7258, 0.7244, 0.7226. Long positions can be opened at the current level with the target at 0.7400 and stop loss 0.7330. Implementation period: 1–3 days. Short positions can be opened at the level of 0.7300 with the target at 0.7250 and stop loss 0.7330. Implementation period: 3–5 days.